After the latest GDP data showed that Italy's economy didn't grow at all during the third quarter amid a spreading European slump that's likely inspiring panic in Brussels, the country's emboldened populist leaders are refusing to surrender in what has become a political game of chicken with the EU over a proposal that calls for an expansion of Italy's budget deficit to 2.4% to fund pension benefits, welfare programs and tax cuts. Ahead of a Tuesday deadline to resubmit its budget proposal, which Brussels rejected last month, Italian Prime Minister Giuseppe Conte was said to be holding a last-minute meeting with the two men who are really running Italy, Deputy PM's Matteo Salvini, of the anti-immigrant La Lega, and Luigi Di Maio, of the anti-establishment Five Star Movement where, according to local media reports, they were expected to - paradoxically - discuss lowering the country's growth forecast from 1.5% to 1.0-1.2%% in order to get a budget deal (it wasn't immediately clear how expecting even slower growth would bolster their case). 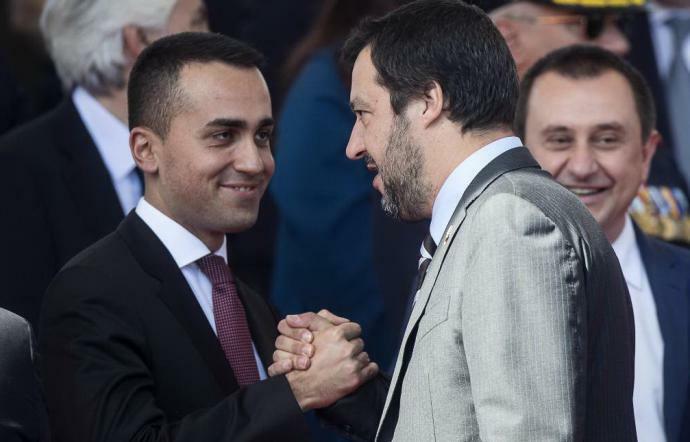 However, while Salvini reportedly had a "positive" meeting with Conte on the budget, Di Maio reportedly skipped that meeting and, in a series of interviews given Monday and Sunday, the M5S leader appeared to dig in his heels, telling reporters at Montecitorio that giving up on the populist government's fiscally stimulative agenda would be tantamount to economic "suicide" that would likely bring about a recession, according to Italian newswire ANSA. "The only way to respect EU parameters is to make a suicidal budget law that would bring on a recession," newswire Ansa cites Italy Deputy Prime Minister Luigi Di Maio as saying. Di Maio said he was agreeing with comments from Finance Minister Giovanni Tria. Overnight on Sunday, Di Maio had similar harsh words, saying the EU cannot ask government to "massacre" Italians in clash over next year’s budget, speaking to La7 television. "What is the limit to dialogue with the EU? If you ask us to massacre Italians for us it’s ’no,’ we go ahead with the budget. If you ask us to cut more wasteful spending, to find more resources, there can be a dialog" Di Maio said, adding that "The Italian people have already given too much for European rules, now is the time to be close to the people." Following the latest standoff, in which neither party is willing to compromise, the spread between the 10Y Italian BTPs and German bunds widened past 300 basis points on Monday, and once again moving closer to the feared "red line" of 400bps, which many worry could kick-start a dangerous negative feedback loop that could push the Italian banking system toward a crisis. Unsurprisingly, Italian banks also slumped on the news. 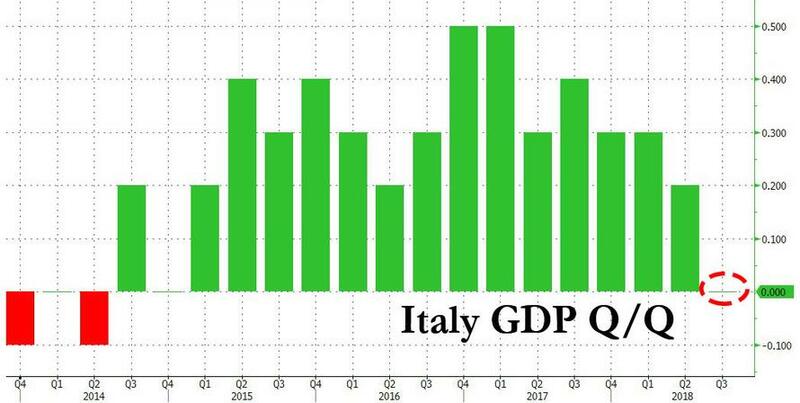 Meanwhile, in further bad news for the deficit negotiation process, Italy's parliamentary watchdog said the government's growth forecasts were overly ambitious, and that the proposed deficit would probably wind up being closer to 2.6% of GDP. In testimony to lawmakers, Ufficio Parlamentare di Bilancio President Giuseppe Pisauro said that the government’s target of 1.5% growth next year is increasingly "ambitious" adding that the economic slowdown "has become more accentuated" and warning that the government’s plans is "subject to risks and uncertainties." Needless to say, the EU will be delighted with this testimony. And with nothing fixed in Italy (or the UK for that matter), contagion concerns once again emerged, hitting the common currency as the EURUSD breached 1.1300 to the downside, the lowest print since July 2017. As the euro slid to its weakest level in 18 months, analysts said concerns about the showdown with Italy were eclipsing fears about a "no deal" Brexit to become the most important factor weighing on the currency.